The Occupy movement targeted May Day as the day "the people of the planet will take to the streets." Crowds formed in many major cities, joining protesters worldwide on International Workers Day to demand economic equality. But the day remained mostly peaceful. Promised stoppages of mass transportation and commerce by the Occupy movement largely fizzled across the country. 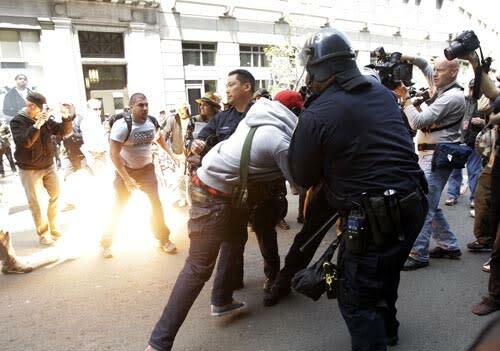 Overall, there were a modest number of arrests and clashes in a handful of cities. Many of the demonstrators reported splinter groups dressed mostly in black who turned demonstrations violent. 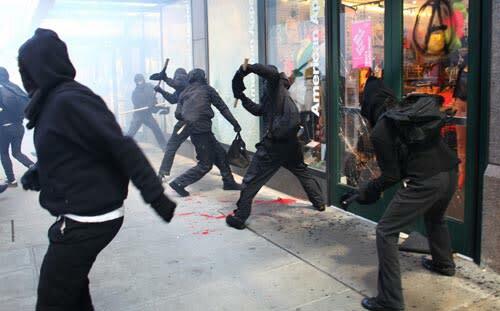 Mayor Mike McGinn authorized a seizure of potential weapons after crowds of vandals dressed in black known as the "Black Bloc" smashed up banks and other businesses with sticks, batons, and rocks, reports the Seattle Times. Niketown and American Apparel downtown were hit. A half dozen Starbucks closed early after stores reported broken windows. At least two were arrested during the vandalism spree. Police said the vandals dressed in black were hard to track because they discarded their clothing to blend in with onlookers. Tear gas was used to stop some of the vandals. The protesters also took out their anger at the U.S. Court of Appeals building, shooting paint balls at it, shattering glass doors, and attempting to ignite an incendiary device. Not officially part of Occupy, employees at Los Angeles International Airport joined May Day demonstrations to protest the hiring of non-union workers. Ten were arrested for blocking an intersection near LAX, reports CBS LA. In another gathering in downtown, a group of protesters appeared to surround LAPD officers, reports the L.A. Times. A female officer was struck in the head with a skateboard, denting her helmet. She was taken to the hospital, but the injury was not life-threatening. The incident marred a "festive" atmosphere during protests earlier in the day. In Oakland, police using tear gas confronted a protest of about 400 downtown. Nine were arrested and at least one demonstrator was reportedly tasered. Protesters blocked streets throughout the day and vandalized two banks in the area. A news van and police vehicle were also vandalized. Earlier plans to shut down the Golden Gate Bridge were abandoned. Golden Gate Ferry workers, however, went on strike over health care coverage and morning service was canceled. A group of a protesters tried to take over a building owned by the Archdiocese of San Francisco -- the same one protesters briefly occupied as a commune on April 1, reports CBS SF. A protester dressed in black threw pipes and bricks from the roof of a building at police. Two arrests were made. The evening before hundreds gathered in the Mission District in San Francisco. As the group began to march through the streets, some protesters began breaking car windows, spray-painting anarchist symbols on restaurants and attacking a police station. One Occupy SF protester disavowed the violence. "I know Occupiers," Jesse Smith told KTVU. "None of us have any idea who they were." Hundreds from Occupy Wall Street marched over the Williamsburg Bridge from Brooklyn to Manhattan, but did not shut down any bridges or tunnels as organizers earlier had planned. About 30 protesters were arrested over the course of the day for mostly minor charges, ranging from resisting arrest to blocking street traffic, reports the New York Daily News. Confrontations were scattered around the city. 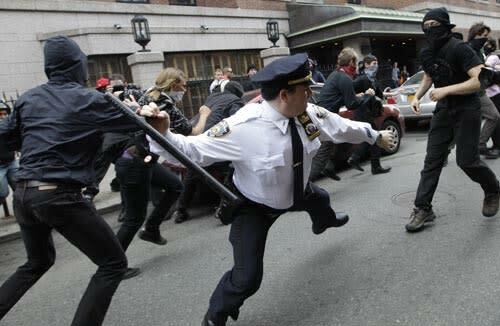 There was a skirmish on the Lower East Side with masked protesters who may not be part of the main Occupy group. Letters containing a white powder that turned out to be cornstarch were sent to various New York banks and media outlets, and one was sent to Mayor Michael Bloomberg, reports the Associated Press. The letters read "Happy May Day..This is a reminder that you are not in control.." said authorities. Five people, claiming to be anarchists, have been arrested in Cleveland for trying to blow up a four-lane bridge across the Cuyahoga Valley National Park. The local Occupy crowd said they were a part of their operation, but have now distanced themselves. The suspects had bought fake explosives and placed them near the bridge Monday. The suspects were arrested after 9 p.m. Monday, according to WEWS. The public was never in danger from the devices, according to Fox News. The explosive devices were inoperable and controlled by an undercover FBI agent. Charges against the suspects were filed Tuesday morning.